If you love to sew bags, then it’s usually inevitable that over time you’ll sew more bags than you know you can use. Or people will start to ask you to make things for them, because they really love your work. You might already be selling your bags at craft fairs, events, or online in your own store or an Etsy store for example. But online marketing and staying in touch with your customers can be tough. What do you write about? How to you persuade them to give up their email addresses? How do you get them to open and read your emails? How do you turn that mailing list into orders and money? There’s one lady who knows all this and a whole lot more. Abby Glassenberg writes an email newsletter that I read every week without fail. 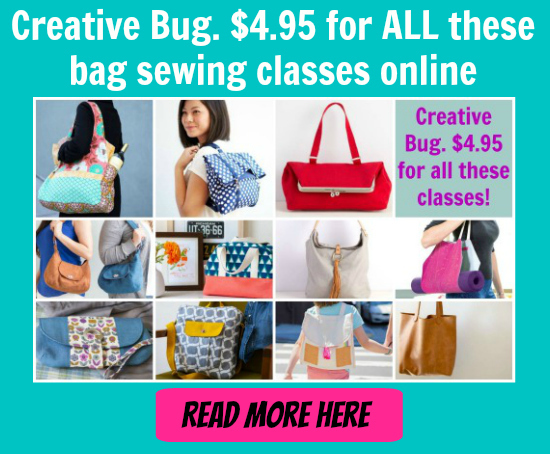 She’s created an online course over at Creative Live called Email Marketing for Crafters that could help YOU get more orders for your bags. Usually the course, comprising 24 video lessons, costs $79, but it’s replaying for FREE on 25th and 26th March at 11:00 EST. Read more about it below or hop on over to Creative Live to watch the intro video telling you all you can learn from the classes. Craft Emails That Facilitate Genuine Connection. A good email feels personal and creates a strong connection between you and your readers. Learn how to develop a compelling, personal, and effective email strategy in Email Marketing for Crafters with Abby Glassenberg. Abby will also guide you through the nuts and bolts of setting up a branded email by teaching you how to customize a template with photos, banners, and graphics. Email Marketing for Crafters with Abby Glassenberg will teach you how to use this powerful medium to build relationships, drive sales, and grow your business in a sustainable and authentic way.